We are living in a time of increasing confusion and turmoil. People in the world are full of insecurity; they are troubled, lonely, and full of self-doubt. In the midst of such uncertainty, peace is a sacred treasure. Yet the sad truth is that many people, and this includes many Christians, have never enjoyed the blessings of true peace. Peace seems illusive and out of reach, and very difficult to maintain in our daily lives. God’s Word, however, encourages those who belong to Him to diligently “seek peace and pursue it” (Ps 34:14). This divine directive is meant to stir us up. 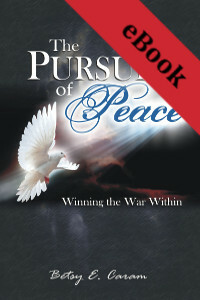 If we truly desire to live a victorious Christian life, we cannot just be satisfied with wishing or yearning for peace. Instead, we must enthusiastically pursue it, and when we find it, we must grab hold of it and not let it go. For all who seek an inner calm from the fears and frustrations of life, it is our prayer that this book will help you in your personal pursuit of peace. Through Jesus Christ, we have been promised “abundant life” (Jn. 10:10). Still, many Christians cling to the wrong belief that abundant life is only possible when we reach heaven. However, there are keys in God’s precious Word—that when unlocked and received within our spirit—will bring us to that place of peace we are longing for in this life. These keys, which are established for us in “The Pursuit of Peace,” will enable us to “Win the War Within” as we conquer our insecurities through the wonderful, life-changing Word of God!